A black and white photocopier only use one toner colour – black (k). They produce monochrome photocopies, which is why they are called mono devices. Mono devices are ideal for companies or departments that print lots of invoices, bills runs, worksheets or large text based documents that require no colour. If you just add a coloured logo to your documentation, it might be a good idea to have pre-printed letter headed paper in one paper trays which can be printed on with just black text to keep costs down. If your business doesn’t need to use colour for its printing output, then a black and white photocopier could be the sensible choice, as they are far cheaper than a colour device, both on purchasing the hardware and service costs. In the last decade, the price of photocopiers in general has dropped. Black and white photocopiers tend to be cheaper than colour photocopiers. However, even though the price has reduced, the technology has continued to advance with mono photocopiers able to network scan and print, duplex print and offer finishing options such as stapling, hole punching and booklet printing to help streamline office workflows. The main-focus of photocopier manufacturers these days is speed and durability, these two parameters are important and are tightly linked. When looking to purchase a new device, you need a machine that firstly doesn’t slow you down, but also is able to meet your monthly print volumes, without experiencing constant paper jams or breakdowns. Black and white photocopiers come in an array of speeds, which is referred to as ‘volume’. Low-volume black and white copiers tend to have print speeds of up-to 35 pages-per-minute (ppm), anything above 35ppm but below 50ppm is defined as mid-volume. High volume devices typically print anything between 60 to 100 pages per minute. Anything over 100ppm is considered a digital press, or print production machine. In general, the faster the photocopier, the more durable the device. Durability is defined in the photocopier industry as ‘duty cycle’. Low volume devices will only be capable of printing a few hundred or thousand sheets per month without experiencing faults, whereas high volume devices will be capable of printing tens of thousands of sheets per month. It is important not to overlook this, as if you purchase a device which is not capable of meeting your average monthly print volumes, you will experience more down-time and ultimately have to replace your device sooner than you should need to. To be sure that the machine will last for the duration of the lease and service period, ideally you should choose a device that has a slightly higher duty cycle than you need, so you don’t have to worry. 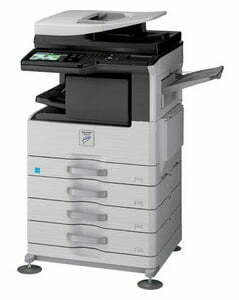 Midshire can provide mono photocopiers from the leading manufacturers, including: Ricoh, Sharp, Lexmark, Toshiba and HP. Black and white photocopiers can be placed on a lease, a cost-efficient method of purchasing photocopiers, which spreads the cost over 3 or 5 years. Additionally, Midshire specialises in Managed Print Service agreements, which can be provided to all mono photocopiers. A Managed Print Service includes all toner, on-going maintenance and emergency service calls, leaving you to get on with what you do best!